Barbero (SS-317) was launched 12 December 1943 by Electric Boat Co. Groton Conn.; sponsored by Mrs. Katherine R. Keating and commissioned 29 April 1944 Lieutenant Commander I. S. Hartman in command. Barbero's war operations span the period from 9 August 1944 until 2 January 1945 during which time she completed two war patrols. She is officially credited with sinking three Japanese merchant ships totaling 9126 tons while patrolling in the Java and South China Seas. On 27 December 1944 enroute to Fremantle Australia Barbero while at periscope depth received an aerial bomb close aboard aft. This near miss damaged the port reduction gear and put Barbero out of action for the remainder of the war. In September 1945 she was ordered to Mare Island Navy Yard where she underwent pre-inactivation overhaul and was placed in commission in reserve 25 April 1946. Following conversion to a cargo submarine (reclassified SSA-317 31 March 1948) at Mare Island Barbero was recommissioned 26 July 1948 and assigned to the Pacific Fleet. Between October 1948 and March 1950 she took part in an experimental program to evaluate her capabilities as a cargo carrier. Experimentation was discontinued in early 1950 and she went out of commission in reserve 30 June 1950. On 1 February 1955 Barbero entered Mare Island Naval Shipyard for her second conversion. 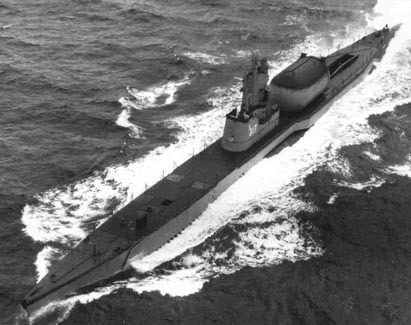 Her designation was changed to SSG-317 (Guided Missile Submarine) 25 October 1955 and she was recommissioned 28 October 1955. She operated off the coast of California until April 1956 when she transited the Panama Canal and joined the Atlantic Fleet. Barbero received two battle stars for her World War II service.